Magento is well known for its feature-rich eCommerce platform, whereas the latest version i.e. Magento 2 is equipped with more advanced features. The latest edition is announced with mega changes to improve the performance of online shop and storefronts and allow the merchants to expand their businesses beyond any barrier. The big change in Magento is now attracting more and more merchants to move and experience the brilliant innovation. But, in order to move, they will be required to have compatible versions of all the plugins, themes and extensions they have already installed in their store. This is where they need to visit the official marketplace and find relevant solutions. Despite the latest version, Magento 1 is still in use by thousands of online stores worldwide, because they are not yet ready to migrate a great amount of data about their products, categories, customers, orders, sales, and a well-established online presence. This is the reason that merchants still using the tools for a foreseeable future, and until they are ready to revamp the website with Magento 2. The plugins and modules they were using on the previous version are still working fine just like the Rich Snippets Magento extension that is recommended for showcasing additional product information in the SERPs and making the search robots know more about the landing pages. The programmers are developing tools for both the versions so that the end users can avail the applications suitable for the version they use. How can developers benefit from Magneto Marketplace? The launch of Magento 2 is created a lot of opportunities for the professionals and web development agencies. The official marketplace has become a hub of top-notch extension where individuals and companies are given the rights to publish their valuable application to the enormous community of sellers, merchants, and fellow developers. The latest Magento version is a hallmark of quality, high performance, and increase online reach that is making the marketplace a mature and authentic place to display themes and extensions. The Marketplace is created to focus on delivering quality to the end consumers. It allows developers to publish their extensions on 30:70 revenue sharing. A product that is sold through this platform splits the revenue, so 30% goes to Magento and 70% is paid to the developer or publisher. The marketplace takes complete care of the payment procedures to let the individual develop innovative solutions for the community members. The sale of free products will surely generate zero in revenues. The developers are required to comply with the defined rules of the marketplace, whereas Magento is helping them with different tools to refine their skills and proceed further in their career. How can you publish Magento 2 extension on the marketplace? Following is a step by step guide to submitting a Magento 2 extension to the marketplace. It may start with a simple submission process but requires you to be patient for the different review processes. Here’s the entire process. Visit the link https://marketplace.magento.com/, create an account if you don’t have yet, and log in to your account. Complete your profile by adding your skills, expertise, experience, and affiliation with a web agency or company. A company that aims to publish extensions and themes on the marketplace is required to maintain a single profile. Once you log into the account, you can add work as products. It can either be a theme or extension. 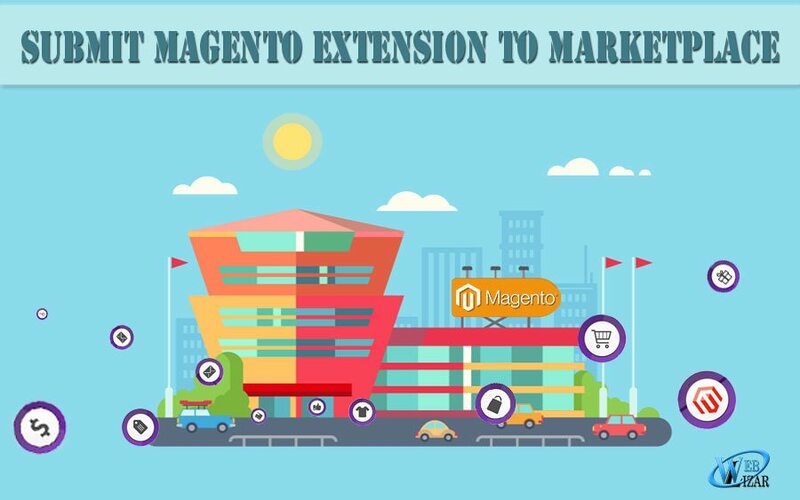 It is the time to put your useful extension on the official store of Magento products and earn money as a reward for your hard work. It is fast and reliable to sell your extension rather than owning and managing a storefront separately and entertain clients. To add an extension, navigate to My Account section; click Developers Portal / My Products / Add Extension. Here, you will arrive at a form that requires details about the extension you need to submit. The primary buttons of the form include Magento 1.x and Magento 2.x that asks you to clarify either your extension is for the previous version or purpose build for Magento 2. Why is This Extension Not in Marketplace? What is the Functionality of Your Extension? The replies to these questions depend on the product you develop. There is not defined answer for suits every extension. Once, you fill all the details, review them again and continue to enter the review process. After submission of an extension, it has to go through a review process before finally being published. Following are the different review steps involved. Business Review – It takes into consideration the information you provide about the extension. This a review is conducted to evaluate either the product is of any help for the community and is saleable on the marketplace. Technical Review – In this process, the developers review the entire product package (either theme or extension) and compare it against the required coding standards. It evaluates the technical aspects of a product that’s why it is recommended to ensure your project qualifies the validation step. There are tools to verify it before submission. Marketing Review – Approval from the technical review leads to marketing review. In this stage, the content, user guides, screenshots, pricing, and installation manuals are examined. It is recommended to keep the prices and features consistently in the content across the submission and your website. QA Review – The Quality Assurance review start with the installation of your extension by Magento team. The product with smooth and bug-free installation is successful in meeting the required standards and their expectations. The product that passes successfully throughout the review processes is approved and make live at the Magento marketplace. The Magento Marketplace is a useful platform for freelance developers and well-established companies to boast their expertise by publishing valuable extensions. Merchants now avoid purchasing plugins from websites other than the official ones. So, it makes the conventional methods of promoting products on different platforms obsolete. With the above step by step guide, you can easily submit an extension, get it published, and add a source of income to your profile. to pass QA Review our extension must pass “Installs with Composer”. how to do this before submitting or magento host our extension on composer itself ?